In case of the (State-)System, self-fulfilling prophecies of various ‘actors’ (e.g. societies and decisionmakers of states) – their mutual expectations – interact and shape each other; it is a process in which the actors are actively involved, playing their part. The process of sensemaking and the security-dilemma play important roles in the process of interacting self-fulfilling prophecies (ISFP’s). The workings of the ISFP-mechanism. 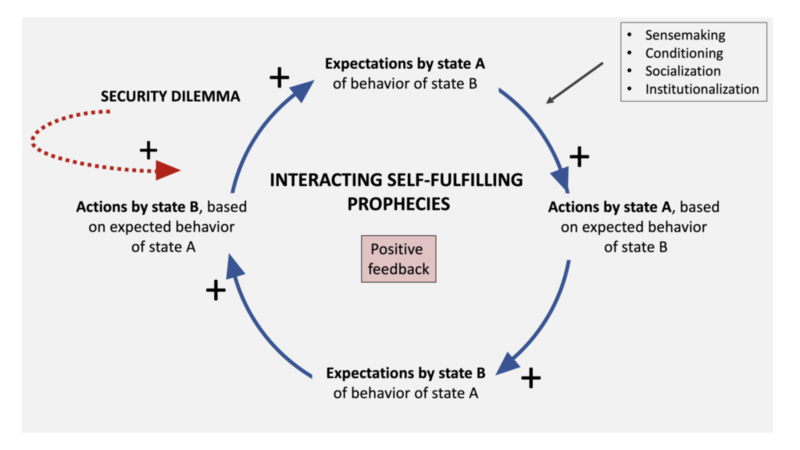 Interacting self-fulfilling prophecies produce and shape issues in the contingent domain of the (State-)System that act as attractors around which tensions (entropy) ‘crystallize’. The ISFP-mechanisms interacts with the security-dilemma; and the processes of sensemaking, conditioning, socialization and institutionalization also play their part. The process of ISFP’s is concerned with the interplay between individual and collective behavior, and with the interplay between the deterministic and contingent domains (respectively the S- and H-imperatives). Through the process of ISFP are states and societies ‘prepared’ to engage in KA/war “at the right time”; the process of ISFP’s ensures that (members of) societies are aligned and states/societies find meaning and justification to engage in war (KA). The process of ISFP is powered by entropy(-production) and shaped by the security dilemma in the contingent domain. During the HCR (high-connectivity regimes) of RSP’s (relatively stable periods) the ISFP-mechanism runs at full speed, so to speak, and powers the autocatalytic process that drives the (State-)System to a critical state. Presently, the System is in the high-connectivity regime (HCR) of the relatively stable period (RSP) of the first war-cycle (1945-….) of the global System (the second dissipative structure or second finite-time singularity dynamic (FTS)). Typically, during HCR’s entropy- (tension-) regulation is problematic, and entropy (tensions) accumulate in the System. These tensions (entropy) ‘power’ interactions between self fulfilling prophecies. In the Washington Post article, “The Twin Hatreds. How white supremacy and Islamist terrorism strengthen each other online — and in a deadly cycle of attacks“, Sulome Anderson, in fact refers to the ISFP-mechanism that now contributes to the accumulation of tensions (entropy), that cannot be effectively regulated, at this stage.